Sea bass is a light and flavorful fish and I try not to overpower its taste when I serve it. 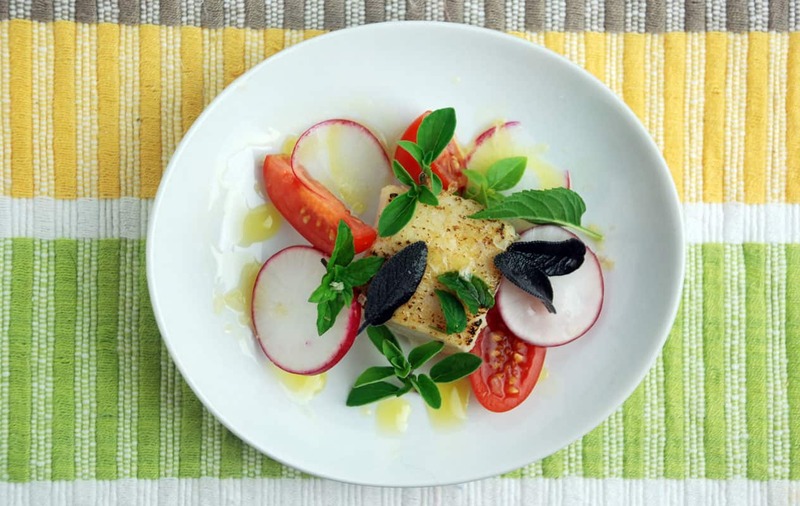 The recipe pairs it with a pungent mustard oil that really shines with a basil, radish, and tomato salad with microgreens. If you can't find microgreens, any spring lettuce mix can act as a substitute. I prefer my sea bass cooked at 135°F (57.2°C) until heated through, usually 25 to 40 minutes. 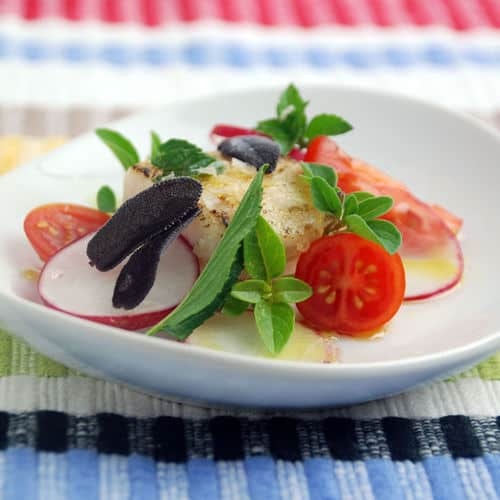 If you would like more information about the modernist techniques, ingredients, and equipment used in the sous vide sea bass with microgreens and mustard oil recipe you can check out the following. Salt and pepper the sea bass and sprinkle with the garlic powder. Place in a sous vide bag with the butter then seal. Cook the fish until heated through, about 25 to 40 minutes. Combine the mustard seeds and olive oil in a pot and set over low heat. Bring to a sizzle then remove from the heat and let cool to room temperature. Pour into a non-reactive container, cover and refrigerate overnight. Strain the oil to remove the seeds. The oil will keep in the refrigerator for several days. Remove the fish from the bag and pat dry. Briefly sear the fish if desired. Place the fish in the middle of a plate. 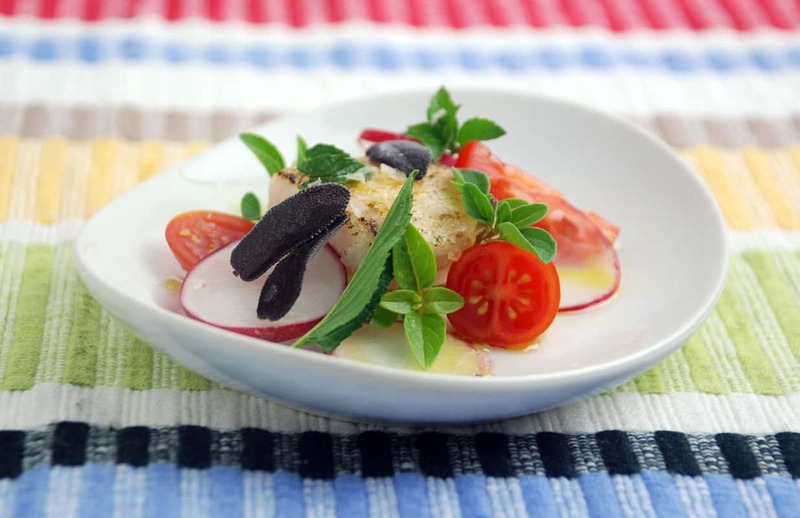 Set some radish slices and tomato halves around the fish. Drizzle some of the mustard oil around the fish. Add some microgreens and basil to the top of the fish. Squeeze the lemon over the top and serve. The mustard oil can be turned into a foam for a playful take on this dish. Once the mustard oil has been prepared place it in a pot over medium heat. Add 5% mono and diglyceride (glycerin) flakes, about 12 grams, and stir until they have melted. Remove the pot from the heat and carefully pour into a heat resistant whipping siphon. If you prefer, you can let the oil cool to room temperature before pouring.